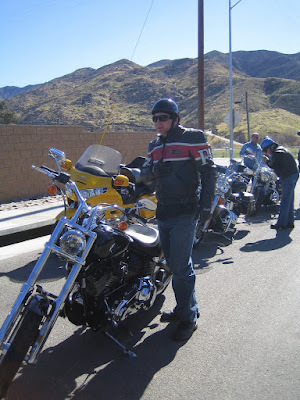 Yesterday I led my weekly "Thursday Ride", this time to Palm Springs for some lunch and margaritas at Las Casuelas Terraza, a popular mexican restaurant in downtown. I had it posted on my Meetup group, and got 15 people to come out, including myself. A few of the people were those I had never met before, along with one guy I hadn't ridden with for a long time, and one gal recovering from a bad bout of stomach virus. I wasn't sure about taking Hwy 243 along the Santa Rosa Mountains. There was a ton of snow there a few weeks ago, and I expected the roads would be covered with sand. A few of the guys with us I didn't know, and a few others I had only ridden with once or twice. But I decided to take it anyways. Prior to leaving I gathered the group together and advised them there would be sand, and to watch the road carefully. When we got to Hwy 243, just north of Idyllwild, sure enough sand. It was everywhere. There were some steep downgrades that carried you into some 20mph curves, with water draining from the melting snow. I slowed myself down, and then hoped everyone else had the caution to do so. There was sand pretty much the entire distance, down to where the highway ended in Beaumont. At the end of Hwy 243, I pulled over and stopped and waited for all the bikes to catch up. There were a few missing. But after a few minutes, I saw them coming. Whew! I felt relieved. We got into Palm Springs, and got seated in the outside patio. Temperatures were in the upper 70s, and nothing but blue skies. Felt really good. Rick, a new guy, is a refugee from the local HOG chapter. He went on and on about the drama in HOG, the cliques, the royalty, and how on every ride the HOG chapter is always asking for money. Complained that all they wanted to do were poker runs and benefit rallies. 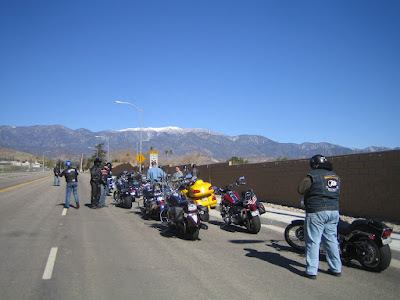 He was going broke just riding with those guys, and wanted to find a group who only cared about riding just for the fun of riding. Art, another new guy, lives in a nudist colony. Apparently, he's knows of several swinging riding clubs in the area, it's a growing trend here in SoCal apparently. I don't know if these are riding clubs who like to swing, or swinging clubs who like to ride. I tend to think its the latter, where bikers and biker chicks are some kind of fetish. Ray, I hadn't ridden with him for a long time. He's a retired air traffic controller. The FAA requires controllers to require at age 55. However due to the budget problems, the FAA has encouraged many older controllers to retire early, and gave them plenty of incentives. Apparently, many of them took up the offer. Now, there's a shortage of air traffic controllers. So they've had to hire a bunch of new recruits. So they're hiring the retired controllers to do the training. Ray will be one such trainer. He still gets to keep his full retirement, and earn more money. Lois, is just recovering from a bad stomach virus. She hasn't been able to keep her food down for a week. But yesterday was her first "real" food. She started off with a margarita, chips and salsa, before digging into her combination plate. And after the ride, she relaxed with the rest of us over some beers. Seems she was feeling pretty good. Later on she chalked it up to the "therapy of riding". I told her it was just "mind over matter", by simply focusing her attention on the road, and not on her sick stomach. Plus, breathing in the soot flying from the highway also helps to kill the virus. I was full from my carnitas burrito. And that giant sized margarita really hit the spot. I kept the group at the restaurant for about 2 hours just because I didn't want to leave. It felt so good to be there with warm weather, great company, and good food. And if that wasn't good enough, the waiter assumed we all wanted separate checks, and just did it that way. At the end of the ride, we stopped at my favorite tavern in Temecula, and found the outdoor patio completely open for us. I sipped down an Alesmith IPA. and we just all sat around and told jokes. At the end of Hwy 243, in Beaumont, CA, waiting for everyone to catch up. In the distance, Big Bear Mountain with snow caps. Last season when I led my first ride as R/C, we ended at a nice mexican food place for the same thing. It was a great cap-off to a great ride. I hear the mexican food out there is much better than it is here. I hope to find out for myself sometime, and enjoy riding in what from your pictures looks like beautiful country. Lol on the HOG refugee. 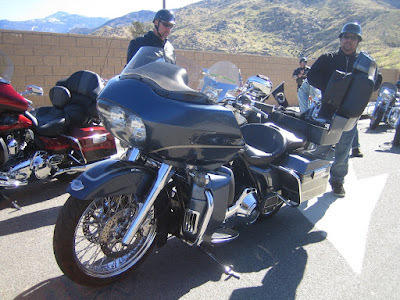 Some of our other blogger friends north of you in the San Fran area (BB & Dave), and Stephanie from Iowa, said they weren't too impressed with their local HOG Chapters either. It's too bad that it has to be that way in some places. I'm very glad we have a good group of people. 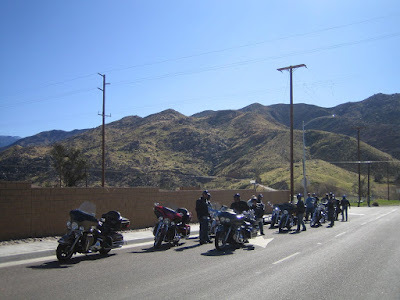 Sure, we do a few charity and poker runs each season, but most of our rides are to do just what you folks did, ride, have fun, and eat someplace nice. I think as long as you can do that, HOG or not doesn't matter. As much as I love being a member of Blackstone, if I ever feel that riding and having fun has taken a back seat to drama and politics, I'll say good-bye. That's when I'll be emailing you Steve - for tips on how to set up my own riding club's website! The title is what really caught my eye. I love both. Nice write up too.